Our French Quarter Travel Guide is finally here! I mean, no one was really expecting this... but finally I wanted to create this since we got back from our honeymoon. Now, three months later... hah. Life, right? If you've been following this blog for awhile, it should come as no surprise that I love New Orleans. So I was thrilled when Alex said he wanted to go there for our honeymoon. 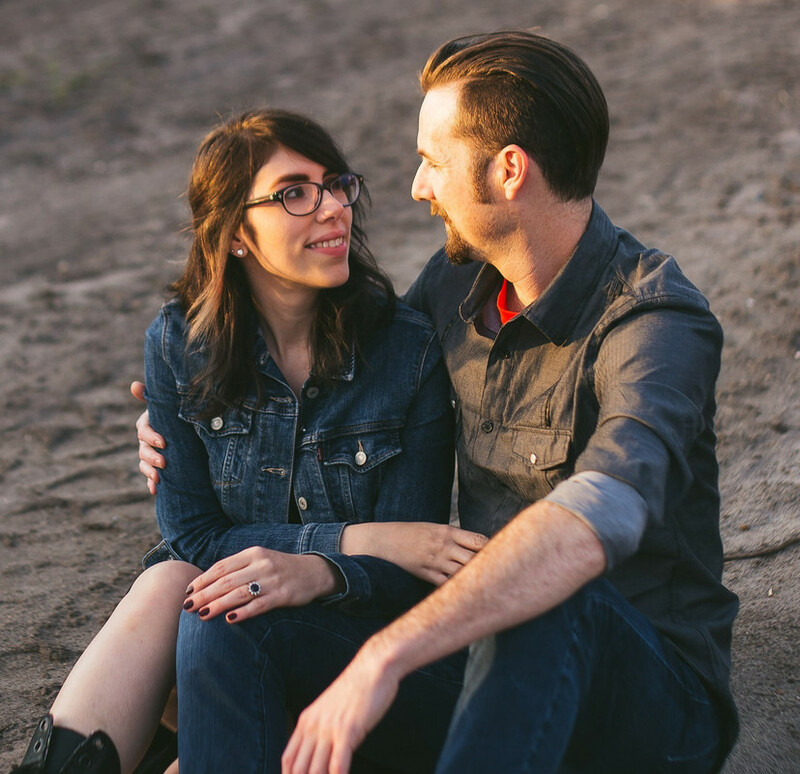 I had a blast showing him some of my most-loved places. Unfortunately, we had to leave two days earlier than we had planned, but I still managed to show him the "real" French Quarter. So, if you're thinking about heading to New Orleans for a few days keep the following places in mind. Alex & I stayed at Hotel St. Marie, in the heart of the French Quarter. What made this hotel cool was the fact that Vacherie was the hotel's restaurant. Since I had frequented their Cafe a lot during my previous trips, I knew that we'd have great food to take up to our room - which we did. But what made this even cooler for me was the fact that the outside of the building was featured in American Horror Story's Coven - which you can see above. Fan girl, I know. But it's my favourite. Anyway, let's move on to some other cool places, shall we? 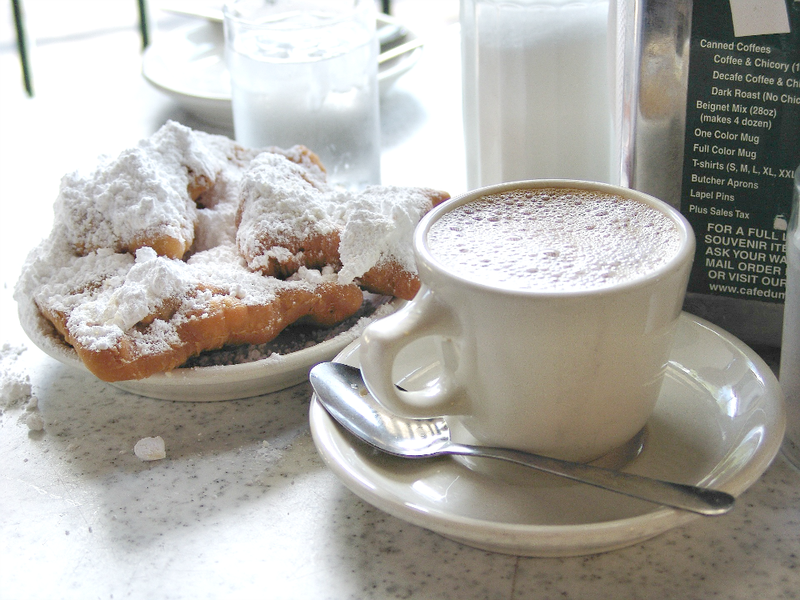 Cafe Du Monde - If you go anywhere else for beignets and chicory coffee, we're not friends. ;) Cafe Du Monde started all the way back in 1862 and best of all, you just sit down at a table and a waiter comes to take your order. The beignets are perfect, doughy fried pillows and their chicory coffee is something I dream of. Vacherie Cafe - Luckily for us our honeymoon happened in February, right before Mardis Gras, so we drank a lot of their King Cake lattes - which were incredibly delicious. But their other lattes are great as well. Tujague's - This is the second oldest restaurant in New Orleans (160 years) and they have the best Ramos Gin Fizz in the Quarter. If you're curious as to what a Ramos Gin Fizz is, it's a gin cocktail with egg whites and orange blossom water. It sounds weird, but I promise you that it is delicious. Even if you're like me and don't care too much for gin. Brennan's - We went here for brunch and indulged on their super fancy eggs benedict. We we're also given free champagne in honor of our honeymoon. One thing we regret not going back to try their famous bananas fosters. Maybe next time. Here's a tip though, ask someone there if they can give you a quick tour of the upstairs. It's incredible! The Grill - If you're craving diner food, which I do at least once a month, The Grill is the place to go. It's classic diner food at it's finest - with a great price point. They also have the perfect cherry cokes (they add grenadine) and the sweetest, sassiest servers. P.S. Their rubens are to die for! Vacherie Cafe & Bar - Somehow we managed to not make it to the actual restaurant - every time we made it there it was closed. However we did make it to the Cafe and the Bar to order food, which we took up to our room. The Vacherie Bar's broiled brussels sprouts with fried pork belly is soo good. Also, their roast beef debris po'boy was incredible! As for the Cafe, I'm addicted to their homemade granola and greek yogurt bowls and have been for years now. Their breakfast sandwiches are pretty awesome too. Coop's - Sadly, we didn't make it here on our trip, but I've been here several times before. It's so good that you have to wait in line for this place, but it is totally worth it. It's a tiny bar with big & delicious meals like marinated lamb ribs, the best fried chicken - hands down - and rabbit jambalaya (don't tell Olive). Seriously, the food served here is unexpected and top notch. Stanley - Delicious Cajun food with a cool atmosphere and pretty, Instagram-worthy white marble tables. If you sit by the windows you can get a great view of Jackson Square and the St. Louis Cathedral. They have great food and outlandishly decadent eggs benedict with boudin. We went here for brunch the first day we got into town and really enjoyed ourselves. 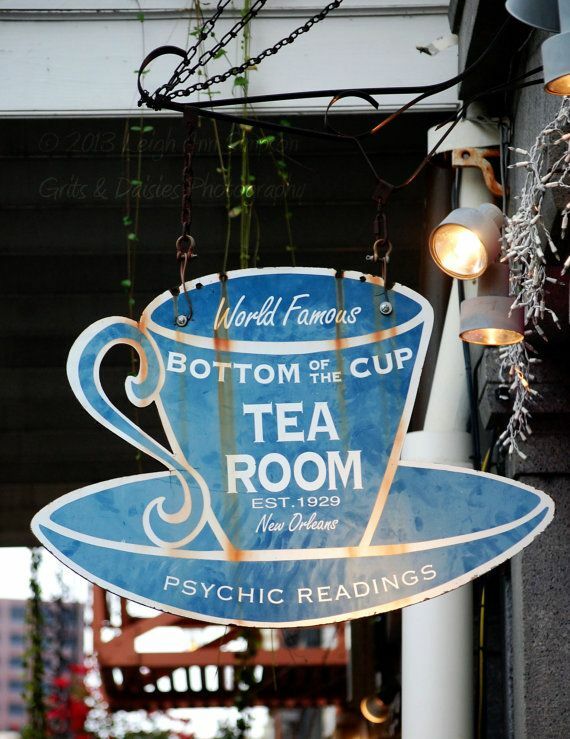 Bottom of the Cup Tea Room - This place has been around since 1929 and has the best loose tea. Every time I come to New Orleans I buy some tea to take home with me. This time I got Strawberry Shortcake Black Tea. Last time it was Blueberry Black Tea. All of it is delicious. If you're looking for sage bundles, they have that too! Esoterica - I go to this place everytime I'm in New Orleans. They have all the supernatural stuff a girl like me could ever want. I've gotten a lot of rare and hard to find books from here too. It's definitely must see place if you're into that kind of thing. Marie Laveu's House of Voodoo - A French Quarter essential. What more could I say? Beckham's BookShop - Located on Decatur Street, this awesome bookshop was on our list, but sadly we didn't make it. I've been here before so I can attest to how awesome this place is. Two stories tall with so many books that they overflow onto the floor into random stacks. Royal Street - Just head down this street for a ton of antique shops and art galleries. Alex & I stopped into so many places that we can't remember all of them. We viewed all of these like museums - it was pretty incredible the items and art pieces that we came across. There are so many to choose from too. You won't be disappointed. French Market - Tons of vendors and shops. Jackson Square - This is my favourite place to head to early in the morning whenever I want to feel as though I am in the middle of it all. The view is perfect with the cathedral on one side and the river on the other. Most days there are artists selling their work, tarot card readings, and live music. Audubon Insectarium - I'm pretty sure this was Alex's favourite thing that we did while in New Orleans. He loves bugs and this insectarium was incredibly awesome. It even gave you plenty opportunities for hand on experiences. Which we both took advantage of, like the Madagascar hissing cockroach. I even rescued a butterfly who tried to escape. St. Louis Cemeteries 1, 2 and 3 - Sadly Alex & I didn't make it, but since I've been to all three before, it was on our list. "Touchdown Jesus" - You have to check this place out late at night. It's located on the back on St. Louis Cathedral. The shadow of the statue reflects itself on the facade of the church. Here's the story behind it. The Riverfront - It's always nice to walk right alongside the riverfront. We started from where the Insectarium was and made our way back to the French Quarter. It offers views of the bridge and steamboats. Latrobe Park - If you're looking for a little getaway from the hustle and bustle of the Quarter, this park offers a nice reprieve. And that's it. Well, for now! I hope you guys enjoyed this travel guide. I had a lot of fun putting it together! If you enjoyed reading it, let me know and I'll keep making them! 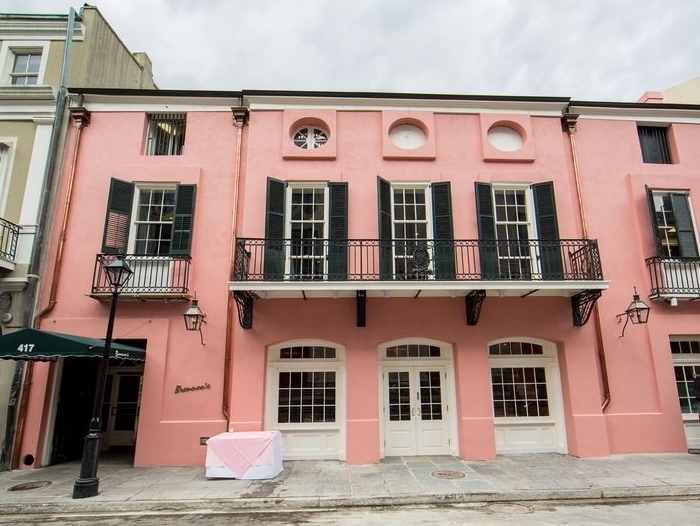 If you've been to the French Quarter before and have any suggestions that I missed, I would love to hear them (because honestly, we have to start planning our next trip!). Let me know in the comments below! I love everything on your list - especially Esoterica! Last time I went to NOLA I received a tarot reading and it was SO spot on. I asked my tarot reader where she recommended I purchase a tarot deck for myself and she suggested Esoterica. I told Lady Mimi at Esoterica that my tarot reader referred me, and she was such a memorable character. I would love to be able to visit NOLA once a year! I still need to get a tarot reading in NOLA. That's so cool that you got one! I did however buy myself a deck of the tarot cards from Esoterica and they are one of my prized possessions. They are so nice in there!